This is the end point and highlight of the Leith Expo-dition at Woodhaugh Gardens. Visit our Lab on the River to find out what fish live in the Leith and its tributaries, how to plant waterways effectively, and discover biological clues to Woodhaugh Gardens’ past life as a wetland. 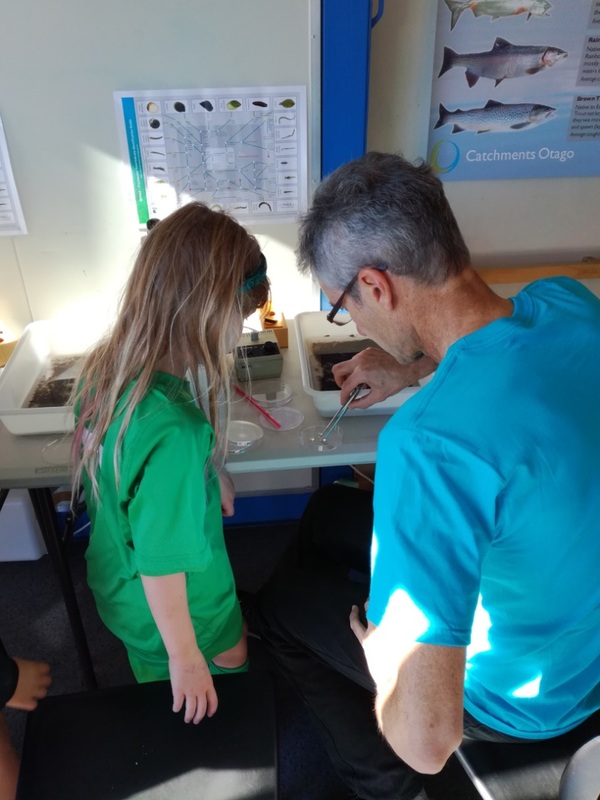 See live critters and native plants that grow near freshwater streams, rivers and ponds, try on our scientist dress ups, check out freshwater poster displays, and chat with scientists about watery things, including our festival guests Dr Mike Joy and Stella McQueen. At this final stop there will be Cooke Howlison and their free BBQ in support of Kiwi Guardians Wild Dunedin Medal programme. A coffee van will be available for a hot drink. A free family fun event showcasing fun ways to get involved in conservation with activities from different organisations to earn a Wild Dunedin Toyota Kiwi Guardians medal. The Peripatus Schools Project will SHOW our research techniques, DISPLAY our artwork, and LAUNCH flyers created by the children on Building Bug Hotels. Sausage sizzle provided by the Dunedin Amenities Society. PekaPeka Bird Feeders - designers Tahu and Harvey will show what makes their bird feeder so safe for native birds and talk about feeding native birds in your home garden. Peripatus Schools Project - Catchments Otago will focus on bug habitats, encouraging children to search for bugs and how to build a bug hotel at home. Lead the Way - Margie is the dog advocate and will talk to dog owners from the Traverse about becoming wildlife certified. They will also have Sandy the sea lion there to aid advocacy. Dogs can be left here for parking up while owners enjoy the expo. Wild Dunedin and Presbyterian Support - Find our Volunteers pushing a supermarket trolley filled up with net vegetable and fruit bags to giveaway - making a change everytime you shop! World renowned Ecological Economist Professor Robert Costanza from the Australian National University will give a public talk about societal addiction to growth and how therapies successful for treating individual’s addictions can be utilised to help build positive sustainable futures for communities. Professor Costanza’a transdisciplinary research integrates the study of humans and the rest of nature to address research, policy and management issues at multiple time and space scales, from small watersheds to the global system. Catchments Otago looks forward to welcoming Professor Costanza to Dunedin and warmly invites members of the public to attend this free event. Societies, like individuals, can become addicted to patterns of detrimental and unsustainable behaviour. We can learn from successful therapies at the individual scale, like motivational interviewing, which engages addicts in a positive discussion of their goals, motives, and futures. One analogy at the societal level is community engaged scenario planning; engaging entire communities in building consensus about preferred alternative futures. Effective therapies are possible, but require a re-balancing of efforts. Catchments Otago and Environment Southland Regional Council looks forward to welcoming Professor Costanza to Invercargill and warmly invites members of the public to attend this free event. Episode 1 - Field Investigations. Have they found any peripatus? Tune in to hear the children talk about what they are doing as part of the project and why, as well as hear some of their findings so far. Dr C and the teachers talk about the project background and discuss why hands-on, real science is important for children. The US faces many legal and challenges regarding watershed management in the Anthropocene. Professor Craig will give some background on the basic divisions in the US between water quality law and water allocation law, jurisdictional fragmentation, and discuss the ways that have emerged tobridge some of those difficulties, drawing from her work both on water compacts and adaptive watergovernance. Robin Craig is the James I. Farr Presidential Endowed Professor of Law, at the University of Utah S.J.Quinney College of Law and affiliated to the faculty of the Wallace Stegner Center for Land, Resources, and the Environment and the Global Change and Sustainability Center. She serves on the Executive Board of the University of Utah’s Water Center. Professor Craig specializes in all things water, including climate change and water; the food-water-energy nexus; water quality and water allocation law; and marine protected areas and marine spatial planning. The William Evans fund of the University of Otago was established in 1946 under the will of the late Dr William Evans, who directed that a trust fund be established for the promotion and encouragement of learning. The University of Otago Research Theme Catchments Otago, a multi-disciplinary theme exploring approaches for sharing natural resources that consider environmental, social and economic outcomes, is hosting a day long symposium focussing on Water & Biodiversity, Water & Society, Water & Health and Water & Movement. Speaker perspectives relating to the four themes will be presented during four 90-minute long sessions, with time throughout the day for fruitful discussions to explore topics raised. The Organising Committee extend a warm invitation to interested individuals to attend the 9th April 2018 Symposium. Registration for attendance is free and refreshments will be provided.